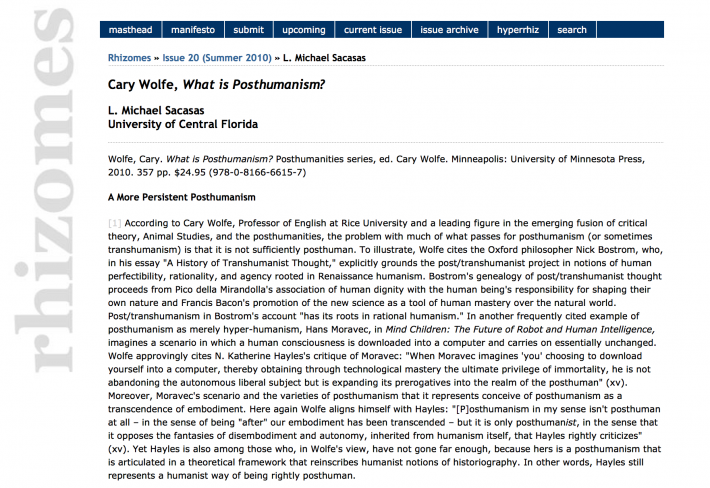 Wolfe aligns himself with Hayles: “[P]osthumanism in my sense isn’t posthuman at all – in the sense of being “after” our embodiment has been transcended – but it is only posthumanist, in the sense that it opposes the fantasies of disembodiment and autonomy, inherited from humanism itself, that Hayles rightly criticizes” (xv). Next Hayles, N 1999, How We Became Posthuman : Virtual Bodies In Cybernetics, Literature, And Informatics / N. Katherine Hayles, n.p. : Chicago, Ill. : University of Chicago Press, 1999.